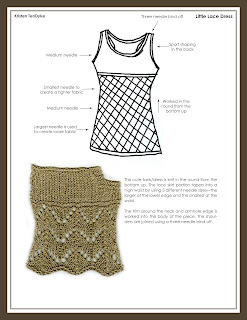 The next design from Finish-Free Knits is the Harmony Dress. 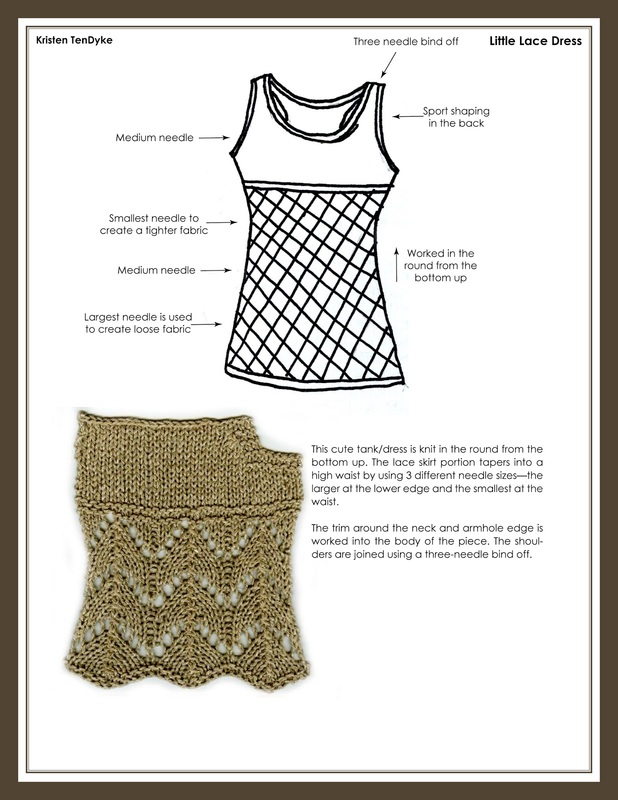 A surprisingly simple lace pattern yields striking results in this little dress. Progressively smaller needles are used in the lace pattern between the hem and bust to create flattering flare in the body. To help prevent mistakes, place a marker after each 10-stitch pattern repeat and count stitches often to ensure errors are caught early on. For a chic accent, weave a colorful ribbon between the garter ridges at the top of the lace pattern. This sporty dress was designed around the same time I designed the Classic Silk Beret. As I was swatching for the beret, I fell in love with the stitch pattern and really wanted to make it into a dress, but was initially discouraged because I didn't want to deal with shaping the lace. While coming up with the designs for this book, I sifted through some of my hybernating designs and found this. It dawned on me that the lace didn't need to be shaped in order to draw in at the waist. Instead I opted to use a smaller needle size at the waist and a larger needle at the hem. For the bodice, there are 2 garter ridges and an increase round. The increase round is written out for each size, so you don't need to figure that out on your own! Then the bodice is worked even in Stockinette Stitch until the armholes divide. The front and back are worked differently, with the back armhole shaping drawing a bit closer together to create a subtle sport shaping. The shoulders are joined with a three needle bind off. The trim around the neck and armholes are added, and that's it! Obviously because of the lace portion at the lower part of the skirt, I'd want to wear something under this. I can see myself wearing it with a pear of leggings and some matching legwarmers if it's chilly, or over another longer skirt to dress it up a little more. Or with the warmer weather approaching, this could be worn as a beach cover-up, over just a bathing suit!